Why is this so inexpensive? Why/how does it cost $45 per month instead of $1000? The medication used as PrEP is patented, which means that only one company, Gilead, is legally allowed to produce and sell emtricitabine/tenofovir in Canada and other developed countries. As Gilead has no competition, they can charge whatever price they feel the market will bear. Developing countries, such as those in sub-Saharan Africa, clearly cannot afford to pay $1000/month for essential anti-HIV medications. Companies like Gilead have, fortunately, agreed to not enforce their patents in these countries. This allows the production and distribution of generic versions of their drugs in resource-poor settings. As a result, over two-thirds of the world’s anti-HIV medications are now produced in India. Other major producers of generics include South Africa, Thailand and Brazil. By purchasing this medication from a country where it is legally produced and distributed in generic form, participants of the Davie Buyers Club are circumventing one company’s monopoly and price tag which is unaffordable for the vast majority of individuals and, arguably, the healthcare system itself. Is generic PrEP as good and as safe as the brand name? Mylan and Cipla are the companies that produce the generic emtricitabine/tenofovir (RICOVIR-EM and TENVIR-EM, respectively) described on this site. Mylan is the second largest manufacturer of generic medication in the world. Cipla is also a large generic medicine manufacturer, with over one million people living with HIV currently taking their anti-retrovirals worldwide. Mylan’s product was approved by Health Canada on 31-July-2017. It is available in some Canadian pharmacies for approximately $250/month. Cipla’s product has not been reviewed by Health Canada. If the product still has marketing protection in the U.S., FDA issues a “tentative approval” rather than a “full” approval. The “tentative” approval signifies that the product meets all safety, efficacy, and manufacturing quality standards for marketing in the U.S., and, but for the legal market protection, it would be on the U.S. market. In summary, this status of FDA approval means that this version of generic emtricitabine/tenofovir is equivalent to the brand name and meets all quality standards that would allow it to be on the shelves of US pharmacies next to Truvada®, if this were not legally prohibited due to Gilead’s patent. How do I know that the medication is legit? Can I get my pills or my blood analyzed to make sure? UPDATE 03-Sep-2016: The HIV/MSM clinic 56 Dean Street in London, England, has published a summary of results of TDM on 162 blood samples by patients on generic PrEP (including Ricovir-EM). They reported zero counterfeits. Click here to read the summary. UPDATE 26-Oct-2016: At the International Conference on HIV Drug Therapy in Glasgow, a researcher from 56 Dean Street presented data showing adequate blood levels of drug among 234 patients who purchased generic PrEP online. Though this did include Mylan’s Ricovir-EM, most samples were of Cipla’s Tenvir-EM. UPDATE 22-Apr-2017: 56 Dean Street presented this poster at the British HIV Association conference, showing TDM data on 277 patients using generic PrEP. UPDATE 11-Jun-2017: a research study measuring drug levels of generic PrEP has launched in Vancouver. Click here to learn more. Why can’t I ship PrEP directly to where I live, in Canada? Canada Border Services Agency prohibits the importation of medication by mail or courier both ‘on paper’ and in practice. Because they physically inspect parcels that are incoming to Canada, they will find and confiscate any medication you attempt to have delivered to you. The only way that is legal, and the only way that works, is to import a 90 day supply (maximum) on your person with a valid prescription. The exception: visitors to Canada (e.g. work visa or student visa holders, NOT Canadian citizens or permanent residents) may import personal medication directly to their home address in Canada. Click here for more details. First of all: I am not a lawyer. However, the research I have done shows that none of the steps in this process are illegal in any of the relevant jurisdictions. Can the government or businesses purchase or distribute generic PrEP from overseas? Can the government force Gilead to reduce the cost of Truvada®? No. Canada, BC, its health authorities and pharmacies are required to follow the law and respect Gilead’s patent rights, so they can only use Truvada® (and as of summer 2017, other versions that have been approved by Health Canada). The province can negotiate modest price reductions — but only for drugs purchased by Pharmacare, not for drugs purchased by insurance companies or by you as a private consumer. The government cannot order a private company to sell a product at a particular price. Out-of-control drug costs are not unique to Truvada® — Gilead’s hepatitis C treatment Harvoni® costs over $650 PER PILL ($55,000 for a 12-week course of treatment). Didn’t Truvada®’s patent expire in summer 2017? Does this mean there will be affordable PrEP in Canada soon? There are now four generic manufacturers with who have their generic emtricitabine/tenofovir approved for use in Canada (Teva, Apotex, PharmaScience, Mylan), but as of 29-Aug-2017, not all versions are available yet in all markets. For example, anecdotally, there are reports of generic PrEP costing ~$250 in Toronto, ~$500 in Ottawa and Victoria, and ~$850 in Calgary. 2017-Nov-14 Update: $250/month generic PrEP is not available at BC pharmacies, but it is available in Ontario. The Village Pharmacy in Toronto will accept BC prescriptions (and insurance!) and will mail your medication to your door. Consider this option to reduce your co-pay costs if your insurance prescription coverage is not 100% , or if you are paying out-of-pocket. Click here for instructions. Even at its most reduced price, $250/month is more than most people can afford. DBC still considers the reduction a step in the right direction, as private insurance companies and the provinces may be more willing, able, and likely to include PrEP on their formularies (list of covered medications). Stay tuned, stay hopeful, and stay involved in advocacy! What’s with the name of this website? The name is a reference to the 2013, Academy Award-winning film Dallas Buyers Club which portrayed people affected by HIV/AIDS in the 1980s who could not access anti-HIV medications. The film’s protagonist imported medications in order to circumvent regulations, monopolies and other barriers to access for people in need. The comparison, I hope you will agree, is not unreasonable. Davie Street in Vancouver’s West End is home to many LGBT people, services, and businesses. It is widely considered to be the hub of gay culture in Vancouver. Who are you and what inspired you to make this website? My name is Alex Smith and I am a healthcare professional working in sexual health and harm reduction in Calgary, AB. I profiled in Vice News, which tells the story of why I created the Davie Buyers Club. Click here to read the article. Previously, I was invited by CATIE to share the story of DBC for their PEP/PrEP webinar on 2017-Mar-17. You can read the transcript of my statement here. Is this generic medication meant for people in resource-poor countries? Will Canadians buying anti-HIV medication online make it less available to people who need it in those countries? The companies who manufacture generic emtricitabine/tenofovir are permitted to produce it (depsite Gilead’s patent) so that it can be accessible to the developing world. However, I have talked with Dynamix about sourcing — they get the medication directly from the manufacturer. I found it reassuring that the medication is not coming from hospitals, clinics, or any part of the supply chain that would impact locals who need it. 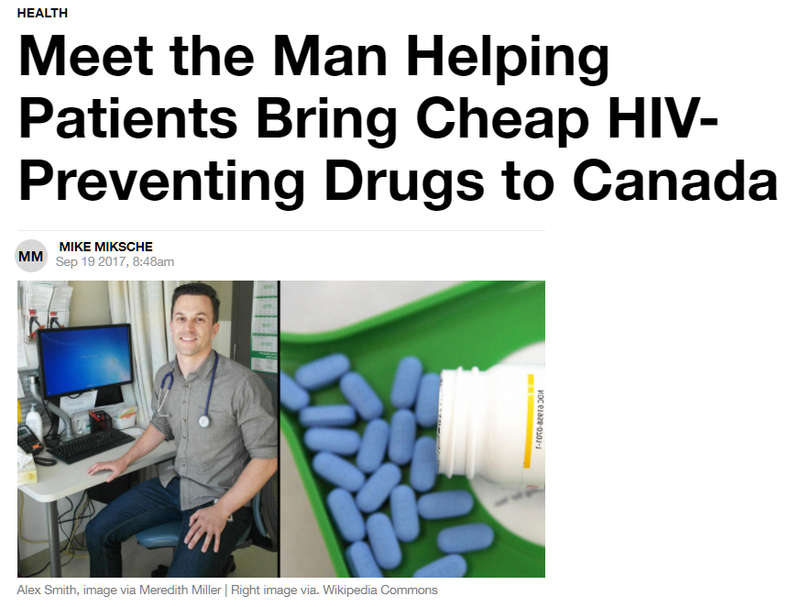 I would never participate in a process where medicine was diverted from the mouths of local people living with HIV to instead be sold online to North America and Europe. To learn more about TasP, click here.